Just before Pacific Gas and Electric Co. announced its bankruptcy in January, then-CEO Geisha Williams stepped down. Now, Tennessee Valley Authority head Bill Johnson’s name is being floated as the utility’s top choice to replace her, according to recent reports. What Will Happen to PG&E? Johnson announced his upcoming retirement from the TVA in November, about a week after a federal jury found that a TVA contractor, Jacobs Engineering Group, had endangered workers during a toxic coal ash cleanup in Kingston, Tennessee. More than 40 workers involved in that cleanup died and hundreds more were sickened. Jurors found that Jacobs is liable for exposing workers to toxic dust in the cleanup. Johnson was not head of the TVA at the time of the December 2008 spill — but much of the cleanup took place on his watch. Earlier this month, Johnson defended the TVA’s ongoing relationship with Jacobs Engineering in a letter to two Tennessee congressmen who sent him a series of questions about what TVA knew about Jacobs’ safety record before the spill, and TVA’s handling of complaints. In the letter, Johnson maintained that "Jacobs has been and continues to be one of the leading contractors employed by the federal government." TVA, which was not a defendant in the suit, “put the safety of its employees and contractors first” during the cleanup, Johnson wrote. While the TVA did not grant The California Report an interview with Johnson, a TVA official cautioned against drawing causation from the jury's decision in the first phase of the Jacobs litigation. "The next phase of the litigation is to determine any actual harm. Up to this point, there's been no verdict and no proof that workers suffered any harm from Jacobs' behavior," said TVA spokesman Scott Brooks. In his letter to the congressmen, Johnson acknowledged that Jacobs "breached duties owed the plaintiffs" to protect workers and that those breaches "were capable of causing various ailments alleged by the plaintiffs." Johnson also maintained that potentially illness-causing elements haven't been thought to be present in coal ash at high enough levels to harm people, "given known exposure pathways and the safety measures required at the recovery project site." Duke University Professor Avner Vengosh, who researches coal ash, disagrees. "There is evidence for the existence of a high level of contaminants. It's really high, and there's no disputing that for people who are exposed to high levels of contaminants, there will be health effects," Vengosh said. Those contaminants arsenic, lead, and mercury. In an email, PG&E declined to comment on the speculation that Johnson will join the company. He would be taking over while PG&E is embroiled in the country’s biggest utility bankruptcy. The company has repeatedly said it had no choice but to enter into Chapter 11 as it faces tens of billions of dollars in potential liabilities stemming from the state’s wildfires in 2017 and 2018. Some industry experts are already expressing concern that Johnson would not be a good fit for the troubled utility. Freeman also noted that Johnson might not have the right environmental portfolio for a California utility. “This guy’s got a mediocre environmental record,” Freeman said. “I don’t think his mindset will fit with Gavin Newsom’s," he added, referencing PG&E’s integral role in helping California achieve its ambitious clean energy goals. In February, Johnson defended a decision by the Tennessee Valley Authority board of directors who, against President Trump’s urging, voted to shut down two aging coal-fired power plants. 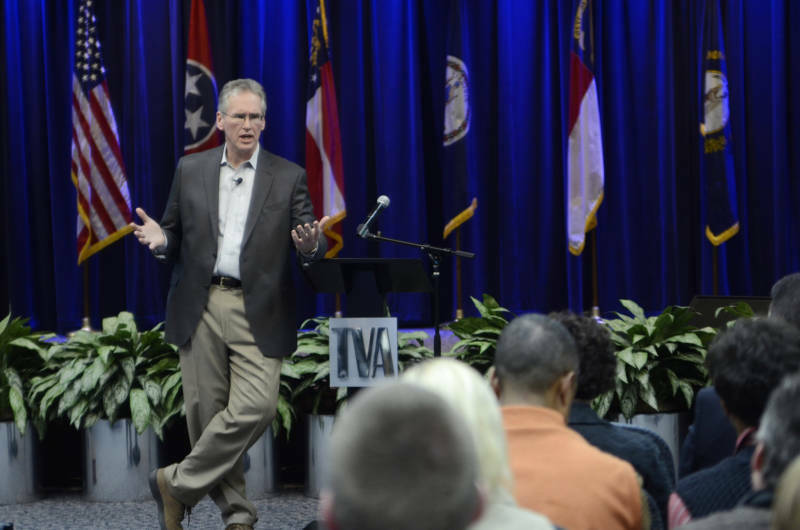 TVA maintained it has had a strong record on clean energy during Johnson's time at the helm. "Over the last six years, during Mr. Johnson's tenure, TVA has increased our portfolio for both solar and wind," Brooks told KQED. "We added the first nuclear power generation of the 21st century at Watts Bar Unit 2, which came online in October of 2016. And we're on track to have more than 60 percent of our energy to be carbon free by the end of 2020. Since 2005, we've reduced our carbon emissions by more than 50 percent." But clean energy advocates aren't impressed. Meanwhile, other critics take issue with the way that PG&E is approaching the process of finding a new CEO. “It should be of great concern to all Californians that the future leadership of PG&E is being decided in secrecy, behind closed doors by the outgoing PG&E board under pressure from a small group of aggressive shareholders,” said former state treasurer Phil Angelides, who’s on the slate of board nominees put forth by the New York-based hedge fund BlueMountain Capital Management, a major PG&E shareholder.